Os grid reference: NX3626 4474. Some 2 miles to the north-east of Port William, Dumfries and Galloway, are three outcrops of rocks known as Drumtroddan Carved Rocks, that are said to have been carved in the Bronze-Age. These prehistoric carvings are located 200 metres south of Drumtroddan farm to the east of the B7085. White Loch of Myrton is just to the south; one of the carved rocks is located in a wooden area close by. And a further 400 metres south-east of Drumtrodden rock carvings there’s an alignment of three prehistoric stones, one of which lies on the ground. The town of Whithorn is 6 miles east on the B7021 and Glenluce is 12 miles west on the A747. 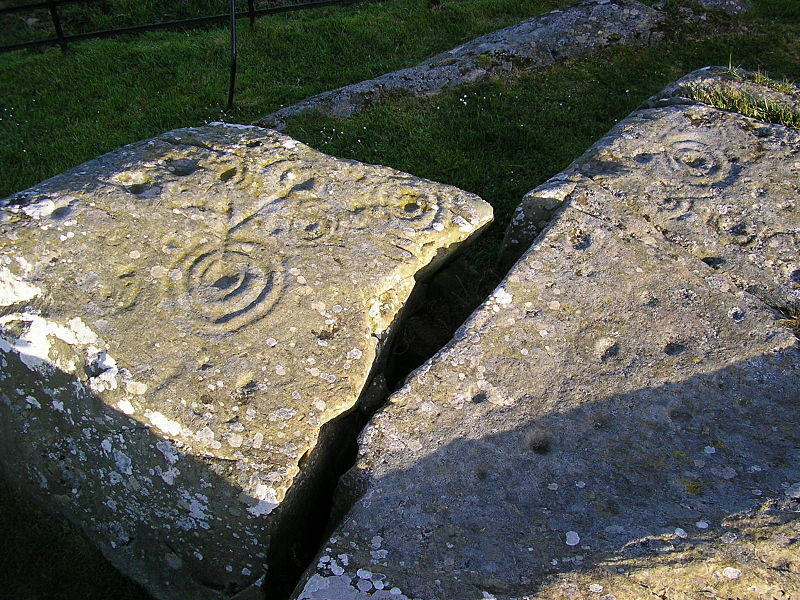 There are said to be between 80-90 well-defined cup-and-ring carvings spread out on the three natural rock faces, the majority being tiny or small, well-prounounced cups with medium and larger concentric rings, with some linear lines (grooves) linking one to another; and there are spiral deigns and other curious (unknown) symbols. The cups have either two, three, five or six rings. Although simple in their design, these carvings are very ingenious. But some might see the carvings as graffiti, or scriblings, though they were, in fact, very carefully and accurately carved at the time – some 4,000 years ago. They remind us, perhaps, of when a stone is dropped into a pool of still water and then we get the ripple effect with circles getting bigger as they move outwards. Another rock with cups-and-rings can be seen 1.4km to the east at Gr NX3776 4438. 400 metres to the east (Gr NX3645 4429) an alignment of three stones (fenced off), two are up-right but one, the central stone, has fallen down. These stones were probably placed here at an earlier date than the rock carvings, but no doubt they are in some way connected. The two standing stones are around 10 foot high and there is a space of 40 feet between each stone. It is thought that a fourth stone stood on the alignment which is orientated NE to SW. The south-west stone now leans at an angle out of true vertical. Bord, Janet & Colin., Mysterious Britain, Paladin (Granada Publishing Ltd), London W1, 1984. Ancient Monuments – Scotland – Illustrated Guide, Vol VI, H.M.S.O, Edinburgh, 1959. Categories: Cup-And-Ring Markings, Rock Art | Tags: Carved Rocks at Drumtroddan in south-west Scotland, Drumtroddan Cup Marked Rocks in Dumfries and Galloway | Permalink. I am still amazed by these carvings…we have a load of them around where I live nr Ilkley…and I never get tired of seeing them. Unfortunately a lot of ours are damaged by by the ignorant or have had modern initials carved on the rocks on which they reside, but I still get a ‘buzz’ when I see them.